Extend an HDMI display monitor up to 333 feet away from the source using gigabit Ethernet. Use with cascaded network switches to extend up to 1,000 feet. Also known as: HDMI extender, Media center extender, cat5 HDMI monitor extender, remote digital HDMI monitor, HDMI transmitter/receiver, high definition extender, extend video, HDMI range extender, HDMI over IP extender, gigabit HDMI extender. One female 1000Mbps RJ45 port for sending high definition video/audio signals and DDC signal. One female 3.5mm jack for RS232. 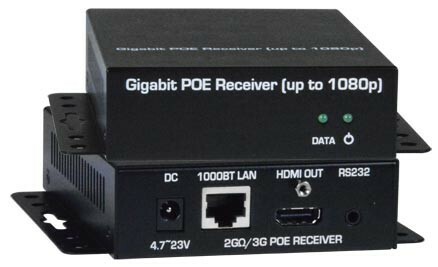 Class 3 PoE compatible (10 watts maximum). One female 1000Mbps RJ45 port for receiving high definition video/audio signals and DDC signal. Signal type: HDMI, HDCP compliant. Supports multichannel compressed audio (Dolby Digital, DTS, THX) through HDMI compatible TVs or audio receivers. Power over Ethernet: With a switch that supports Power over Ethernet, a power supply is not required at the local or remote unit. Local and remote unit: 100 to 240 VAC at 50 or 60 Hz via AC adapter (not included). Country-specific AC adapter sold separately (PWR-SPLY-IPHD2GO). 330 feet (100 meters) over CAT5e/6/7 cable. Use CAT5e/6/7 UTP straight through cable for TIA/EIA-568B wiring terminated with standard RJ45 connectors (not included). Firmware provides video wall applications in sizes ranging from 1x2 to 16x16. Any combination is possible within those limitations (e.g. 2x4, 1x8, 5x5, 6x2). The video wall set-up software is built into the units and can be programmed through any web browser by entering the IP address of the transmitter. With IP-based control systems, the screens can change modes dynamically from video wall modes to standard modes. Works best with progressive video signals such as 480p, 720p and 1080p. Dual mode capability enables higher display quality. Use one transmitter for each row of the video wall to boost picture quality. Ideal digital signage solution for sports bars, emergency response centers, etc. A managed network switch with VLAN/IGMP support is required to set-up a matrix switch configuration using multiple transmitters and receivers. Each VLAN configuration acts as a separate HDMI Over IP channel on the network. Display receivers attached to a port on the managed network switch can be connected to any chosen VLAN to display that particular HDMI channel. Configuration settings can be controlled via a managed switch's own web interface (where applicable), with IP commands, or the switch's RS232 control port. Control software on a PC or other other home automation controller hardware, such as Control4 or Creston, can be used to simplify the process of commanding the managed network switch.